Syria Fashion, coming to a city near you. A Syrian family who fled their home country from civil war is now close to opening their own business in Wolverhampton thanks to the help of a refugee charity who received financial report from the Foundation’s Community Matters programme. Ahmed and Ghousoun Al-Bakari, who fled from the besieged city of Aleppo to escape the violence of the Syrian Civil War, have been living in Wolverhampton for more than two years after successfully applying for asylum in the UK. 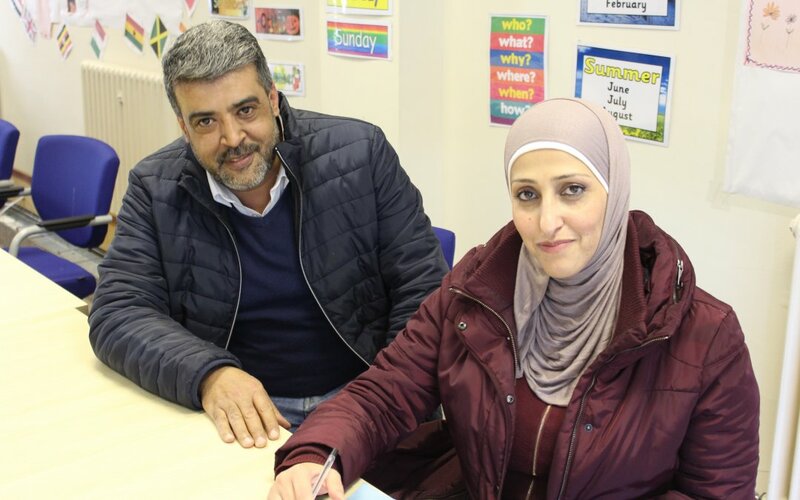 Once they arrived, the Refugee and Migrant Centre (RMC) in Wolverhampton helped Ahmed and Ghousoun, as well as their 20-year-old son and 19-year-old daughter, settle into the city. And now, it is hoped Ahmed, a tailor with 25 years’ experience, will open his own shop in the city thanks to the RMC’s support. The couple received £5,000 towards their business after successfully pitching it to MiFriendly Cities – a charity which helps refugees and migrants settle into the UK. Ahmed said: “In Syria, I worked as a tailor for a very long time, and I’d love to open my own business in Wolverhampton. We’d like to call it ‘Syria Fashion’. I will make the clothes and Ghousoun will help with sales. “The RMC has helped us look for premises, and is giving us advice on how to register as self-employed. The Community Matters programme was funding through the National Lottery through the Big Lottery Fund and European Social Fund. The funding was made available as part of the Building Better Opportunities (BBO) Community Matters project which helps people across the Black Country move into employment or training through support. And the RMC has helped the family since they arrived in Wolverhampton thanks to the funding. “When we arrived, we found it very difficult,” Ghouson said. “We couldn’t speak much English at all – I only knew a few words. But the RMC signed us up for language courses, and helped us find work at the job centre. Steven Bayliss, project co-ordinator at the RMC, said asylum seekers can often find it difficult to settle into a new country, and often needed support. “Our work is all about helping refugees and migrants integrate more easily into their communities. “We help refugees and migrants with all sorts of issues, such as helping them learn English, writing CVs, and even something as simple as helping them with a letter they might not understand. “Ahmed and Ghousoun are now within touching distance of opening their own business thanks to their successful pitch, and we’re so pleased to have helped them get to that point. Tina Costello, CEO of the Foundation, said: “When the Foundation decided to manage the BBO Community Matters project in the Black Country, this is exactly the sort of thing we wanted organisations like the RMC to achieve. To find out more about the Foundation’s Community Matters programme please click here. We have the knowledge to target your funds to the passions that are close to your heart. Job club making a difference. Coventry kids bring the culture! I’d love to be able to go into mechanics. ©2018 Heart of England Community Foundation.